"Watch As Your Child Becomes A Natural Leader"
You know the kid you grew up with in high school who always got good grades… was the star athlete… Played a musical instrument or sang really well… and everyone seemed to like? … The one who made it look so easy—as if she didn’t have a worry in the world? And you don’t have to hope and pray your child has it too—because you’re about to discover how you can give it to them –quickly and easily! … Believe me—I KNOW what a difference “THE KNACK” can make! 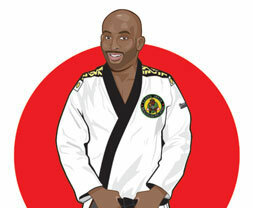 My name is Lloyd Irvin, and for over 10 years I’ve run Lloyd Irvin’s Martial Arts Academy here in southern Maryland. During that time I’ve taught martial arts to many different people and on a daily basis I’ve worked with kids of all ages and backgrounds. Our unique martial arts program at Lloyd Irvin’s Martial Arts Academy did all this and more … but now … this summer we can offer your child something EVEN BETTER! Give Them The Awesome Power of: Lloyd Irvin’s Karate Sports Summer Camp! This summer, after school lets out, instead of hearing your kids complain about how bored they are all summer – enrich their lives with Lloyd Irvin’s Karate Sports Summer Camp! Your child doesn’t need any previous martial arts experience, only a strong desire to have fun! Weekly Six Flag Trips! EVERYONE loves six flags -- whether braving The Penguin’s Blizzard River or the Typhoon Sea Coaster or Shipwreck Falls -- your child will be having fun ALL day long! Lloyd Irvin’s Karate Sports Summer Camp is NOT like any other summer camp, there’s truly nothing out there like this. Your child’s memory will improve and her learning ability will increase too! Watch your child’s grades go up… and… stay up! Our special martial arts training gives your child the discipline needed to study, complete homework and organize their time more wisely—and these skills make success a habit, not a chore! Watch as your child becomes a natural leader! 2. Because if your child naturally becomes the leader within her circle of friends you’ll NEVER have to worry about her making the wrong decisions because she gave in to peer pressure or other negative influences! Training your child how to become MORE independent and develop great leadership skills is one of them most important things we teach at Lloyd Irvin’s Karate Sports Summer Camp. You’ll love how your child will have such a positive attitude and outlook in all areas of her life. We teach our students the absolute importance of having a positive mental attitude so they learn from all their failures (without becoming disappointed or depressed and quitting) and they grow even more from their successes. Your child will be flat out pumped and excited to go to summer camp, there’s always something new and fun for them to do and it’s NEVER boring! Compare to the Other Options For Your Child This Summer? are Repeat children from the summer before!You're child will have tons of fun! Nothing is worse for a child than being bored. And that's exactly what they'll be the whole summer vacation if they just stay home and play video games, watch movies or wander around their neighborhood! And the worse part: Boredom often leads to making bad decisions! At LIMAA, we teach your child Thai-Jitsu so she'll be able to defend herself (or a loved one) if she ever needs to. All our instructors are competent black belts (many are multiple black belts in many different styles of martial arts!) and have the experience and knowledge to train your child correctly and safely! All our instructors have experience teaching children in a controlled, safe environment.They like to see kids have fun but know when to step in and say "wait a minute" when situations start to get reckless and potentially dangerous. them and make sure they're being safe! the best summer vacation of their life! AND safe time this summer. staff at Lloyd Irvin’s Karate Sports Summer Camp. your child to be strong, flexible, agile, quick and coordinated! "It’s all about Structure and it’s about discipline "
Well my opinion with the staff: My daughter is one of the counselors for the summer program. They truly teach you not only discipline and structure but the Word of God is in this place. There is a lot of love in here so it’s not just about martial arts it’s teaches you to be compassionate, to be respectful, you have to communicate and this more than a martial arts academy. It’s not a girlie activity like ballet, gymnastics or ice-skating where a lot of the emphasis is on the child; especially a girl’s weight. Instead it’s on her being strong and confident and doing what she needs to do to be a good person. Master Lloyd Master Donnie I’ll tell you these guys are phenomenal, yes I’m very please with the program and discipline that they teach, they do care about not only my son but every child that comes here they care about you no matter how good you are or how much they have to teach you they let you know that. You are still important, you are still special but at the same time it’s all about structure and it’s about discipline and just listen to what their telling you to do, be the best you can be, their not here to criticize their here to make you better, I’ve seen a huge difference in his confidence, his self-esteem, he loves people and the interaction he’s having with the students has been very well, his behavior has gone from I don’t care to I can’t wait to come to class. I just love the program." "The positive benefits of the program for my son is his behavior, his mannerism and his positive outlook to the future for him about going to school and doing the right thing paying attention just listening. There is an increase in his self-esteem and his confidence. He wants to do well, he wants to be a good boy, he wants to learn and he likes being appreciative and praised. So he really boosted up a lot." Martial Arts to another parent." The staff at the Lloyd Irvin’s Martial Arts Academy is very professional. My experiences have been nothing but positive. Anytime I had to call or to talk to the instructor with any concerns it’s been a very positive experience they always conducts themselves in the most professional way and it’s been nothing but advantages and positive experiences, nothing negative no disadvantages at all. the adults classes as well as the children classes. I think it is a great opportunity to do things together with your child which they seem to really like it, they think it’s kind of cool when their parents participates in the same thing they are participating in. in kindergarten last year, the teacher said that his attention span is really good. A lot of the children wander off, but since he has been here, he knows that he has to look directly to the teacher to talk. She told me last year that she had noticed a change from January to June. She could understand his english and things more clearly. He is right there with his undivided attention with his teacher. Angelo was very quiet. He wouldn’t speak up; he wouldn’t take up for himself. He’s beginning to speak louder now, he is speaking more clearly because Grandma sometimes couldn’t understand him. It’s like he is an entirely different little grandson, that’s what he is. I can see a big change, I really can He is really growing to be 6 years old. I can see the change. I think I have another Master Lloyd on my hands, I hope so!" "The benefits that I see in my daughter is that her coordination has improved tremendously." 'The positive benefits in myself is that I am in much better shape. I able to do things on vacations like climb mountains and go kayaking and just basically enjoying my life alot more because I’m in great shape and I have much more confidence in myself and my physical ability.She’s starting to be able to do many more things. The instructors at LIMAA are fantastic, they are very positive , very encouraging, they expect a lot but they are also know our limitations. The staff is very easy to work with,everyone is very friendly and very helpful. She seems much more confident in what she does as keeping more to her individual self that she doesn’t follow , it’s a part of her personality that she’s not a follower and it seems to be even more so the longer she stays here She’s more so of an individual, a leader rather than a follower." respected staff, not only teach him martial arts, but are excellent role models as well. Observing their behaviorism/mannerism Malachi is learning excellent social skills, how to become a leader not a follower and to respect others. I know the way Malachi looks up to them and strives to be like them is having a positive affect on his growth into manhood. From this experience I’m truly confident that Malachi will become to highly confident, well respected, successful, young man. Thank You! Lloyd Irvin’s Martial Arts Academy for all that you have done for Malachi and what you will continue to do for him in the future." Look, I have a two year old son now, so I know what it’s like being a parent. And if each of us is REALLY honest with ourselves, we all FEEL like we could always be just a little better of a parent. Maybe we just want to give them a little better life lesson… or help them more with their school work… or spend more quality time with our kids. My point is this: My son is only 2 years old, and there are already things I wish I had done better in raising him… I just love him too much to not care about being the best parent I can be. … and ask for Mr. Will or Mrs. Rose. We’ll help you and your child plan for a great summer. Plus, I’ve put ALL the risk in trying Lloyd Irvin’s Karate Sports Summer Camp out squarely on MY shoulders … by giving you the chance to call and have any of your questions answered completely risk-free! If you care at all about giving your child the summer vacation experience of their young life, I urge you to call the number below and find out how we can get started TODAY. P.S. Special VIP discounts apply if you act RIGHT NOW!! Learn more by calling (301) 449-KICK (5425). If you’re at all interested I’m urging you to call right away and reserve your child’s spot NOW. We’re sure to sell out again this year. So please don’t delay, Call (301) 449-KICK (5425) today, right now in fact – while it’s still on your mind!